For what it is worth, I took a look at a long term EUR/USD chart (one that presumably uses the DM before the EUR) It went back with dotted prices to 1970ies-ish. I had applied my EMAs to the chart so even if the older prices only appeared as highly irregular dots - the EMAs were still calculated, so it gave a real nice overall picture. Before I saw this chart, I was definitely more bearish on Gold than I am now - even if I had left the most negative view behind at the end of last year. As a side note all this gold-this and gold-that chatter coming out of several establishment banks and funds makes me quite uncomfortable - scorched nose, I guess. Anyways - my improved optimism was due to the EUR/USD and Gold often goes up and down together. The EUR/USD weekly chart was in a real purdy long term up-sloping channel that has been respected again and again. It is now at the very bottom of that channel and has tested once and broken upwards. Last time it tested twice. If it comes back to test and hold or if the break-up holds and runs - and the correlation with Gold holds - that would suggest that we are going up for real. So to my relatively untrained eyes - it looks like a channel tested and approved for time to go up. With all the negative Eurozone news - the lack of a break-down may signal that it is not going to break down. Of course a BIG euro bank crashing may still change that picture and DB and Credit Suisse is certainly in the news..... but the chart looks as if it has been respecting the rules with retraces etc - and it has just completed a massive slide down and few things go in a straight line as they say. @ Solsson - 10-4 Rubber Duck. What is on my mind, is that the posturing and rhetoric, the threatening stance, might have an additional objective to boost (or at least support) the oil price. I am assuming that TPTB are now desperately trying to shore up the oil price. It is possible at this stage, that most major players on the ground (USA/Wall St, Saudi, Iran, Russia, with the exception of Turkey, but who is anyway on the US leash) would likely all wish to see a higher oil price, for their own domestic reasons. It is not therefore inconceivable, that both camps might see the side benefit of an upswing in tension, even though they also fear escalation, and even though would not trust each other enough to contrive such a thing. A farcical and uneasy confluence of interests? I don't think that events on the ground are being driven by this, but all sides will be aware of an oil price effect, so we should also bear it in mind. Have we seen a full fledged military assault, or just a few artillery shells for the purposes of a few headlines? If the oil price crash was in any way contrived or consciously aided by any party or parties, they are probably regretting it now and looking for the exit, or at least some respite. If those headlines are inadequate, then it will take more than a few artillery shells, and then it gets dangerous. In the meantime, the oil price is up a couple of dollars since Friday, which these days, is nearly 10%. If cash is debased or devalued, it doesn't equate that we would have a C down? So maybe we got the answer, stay in cash between B->C or short stocks of course, but I do not know how to do it with options, mini-futures etc. I am over and done with the certificates, it's a bank fleece common good people product. And noooo I didn't sell a thing, I am still 80% explorers 20%cash, I will wait for the potential B I guess, allocating my last 20% during summer low. EW AND 8-YEAR CYCLE = NO NEW GOLD BULL? Some believe the move up from December, 2015 is counted as corrective rather than impulsive, (due to overlaping) meaning the overall movement for that B wave is taking the form of a zigzag. From the Dec lows to this morning wave 'a' is complete. Wave 'b' is now unfolding and 'c' will take us up to circa 1345. According to the 8-year cycle jockies the major low in prices must occur between Sep-Oct, 2016 at the earliest......OR July, 2017 at the latest. More recently, I have also read that the 8-yr cycle lows since 1970 are indicating a low during the March, April 2017 period at 800 gold. I overlaid the GLD from 8 years, 8.6 years, and 9,3 years (adding 0.6 year once and twice) back onto it to give a visualization aid for the scenario you described. Not a forecast! But it does enable a thought process about the wiggles and swings which would accompany each of the three 8 year cycle going up hard scenarios. I will say the the longer version, the 9.3 year in green, produces a higher low reasonably close to a time that I have a great interest in for the gold market. That intrigues me a bit. Here are the most interesting two charts from that again, but events have moved on a bit since I made them. Above: The gold low we got at end of 2015 .... I didn't do too bad there. What song were the other analysts singing back then? This one places the low as Eclectic stated. It also puts the breakout later, somewhere about end of 2018. I guess we wait and see like all the other times. So a year and a half ago, when I wrote that essay and posted it with those charts, I was on the right track. What I forecasted for 2015 at the beginning of the year, was a trading range with the likelihood of it's deepest low at the end. We got it. But what we got was a descending trading range in a channel with the lowest low for the year at the end of 2015. But we move on and the mystery of 2016 now beckons. Lot's of gold bulls seem to be stepping up and calling 2016 that way. I haven't made any 2016 forecast here just yet, but I will be reluctant to go against those two "old" charts above when I do. Ok, talking about sync of events, guess if I was surprised yesterday when I opened this site for the first time this year, I follow him a couple of times per month, a blue collar view. Thank you for the favor of your valued response. A great deal of effort went into your investigation of the 8-yr cycle. Since I mentioned it, here's that X-wave EW count. Final C could be a wedge which fails to make new lows but takes several years, or it could be a more bearish impulsive downswing as shown. I have no preference between any Elliott wave count and consider any and all valid alternatives as possible. There are almost always other alternative and variant counts. For non wave counter readers: Elliott is not actually a forecasting method in the way most people think it is. What it actually is, is a scenario-from-many-scenarios testing method. It suggests to us which scenarios are possible and which are not, and usually provides quite a number of possible scenarios - any of which may be the one that subsequently plays out. So Elliott says to the wave counter something like: "If it starts to move this way, this such and such a count (scenario) is the one chosen by the market, and it may end up looking like that." Naturally this makes EW very suitable to setting stops to get out early if it begins to go against a trade or investment or theory. Stop setting (rather than forecasting) is the great value provided by wave counting. 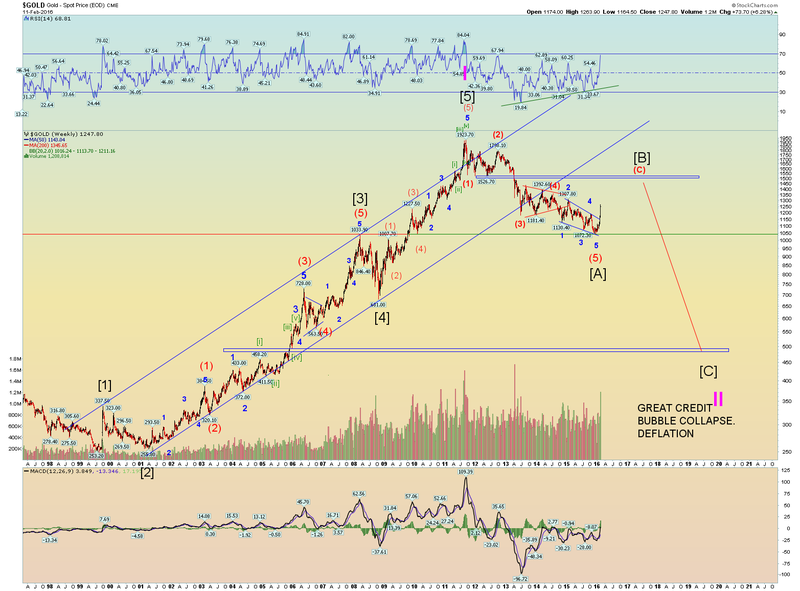 Tony Caldaro has a big A down possibly completed, gold rising into a massive B upwave. Daneric's recent long term gold chart is for an A down, entering a B up followed by a C down, all to complete a huge wave 2 down to c.500, and followed by a a wave 3 upwards rocketshot. I would characterize this as a call for a deeper bear after this/next rally which would give birth to a stronger bull once done. I send you a private message regarding your question..... Some of it has to do with AMs look at the presidential cycle and gold (i.e. why I think gold "bottoms" toward the end of this year or even 2017), other bits more to do with the way I see this situation unfolding. If you didn't get it, let me know, i'll e-mail it too you. Guys, maybe I'm the only one who doesn't 'get it' but I would challenge the concept behind ALL of their counts showing 5-waves down. I am repeating myself here, but there is NO WAY the initial move from the August, 2011 highs can be viewed as 5-down waves! Maybe I'm too much of a purist. Even if you view the waves as overlaping, it still does not qualify as a leading diagonal. I studied the hourly charts during that time period. And that's why the move down was deceptive. All along it looked like a correction. Having said that, I can't say what the consequences are from a change in this analysis. Any fans of the EWT should read A.M.s post first before getting into any detailed analysis of the principles. An excellent and balanced description. RG, thank you! I will certainly look forward to evaluating your analysis! Embarrased to admit, but I'm low-tech and don't know how to access your e-mail on this site? Again, thank you. Ron has been singing this tune for at least a year, and like many of us, waiting for the turn. THE CORRECTION IS COMPLETE. “The forces in the direction of the larger trend are so powerful that the pattern becomes skewed in that direction.” E. W. P.
P.S. The shaded blue area is the start of large volume selling. It will take a lot of buyers to plow through the next 50 points on the index. When you log-in, up the top of the webpage should be a menu-bar that says "Turds vault | Inbox | Account | ...." etc. Click on Inbox, the message should be there when you check. That being said, I really don't know what to expect over the next few weeks/months. It feels like something big is going to move a lot of markets very soon. If you are right and gold does begin a huge move up here..... well I don't even know what that would mean... I think it goes to high 1200's to mid 1300s before coming off the boil and drifting lower for the next 12-18 months.... But as always watch the other currencies gold is priced in! I read that Ron Rosen link, out of morbid curiosity. I know nothing worth knowing about EW, but can someone explain how on earth his waves can make any sense ie. how in the name of God can the move from 2008 to the 2011 high - an almost doubling of price from the 2008 high he labels as Major III - be considered the B wave of a correction? Seriously, WTF? Ron Rosen with his Delta analysis tool said many years ago that if gold broke 1179 then the market was truly broken. I think the only thing that was broken was his tool, ltd points calculations. After an eleven year upmove I guess a 5year + bear is a natural pattern. After the first correction down to 1040 we are in a new upmove to 50% fib level. Then a final wave down to a new low, the deflationary crash, even Mike Maloney is calling for £7 silver. ​This is my preferred scenario, and only a guess, by looking at my favorite analysts out there. I will skip all trades in between. LOL! IMO that scenario you painted has about zero chance of playing out. SR; Rosen has been touting this count for a long time. I am not buying it because I have never seen an irregular correction where wave B goes above the beginning of A by such a high percentage price move. Apart from that, the wave breakdown that Daneric notes is a really perfect 5-wave up classification from A to B. Just my 2-cents.